VidMate Video Converter is the most stable and comprehensive multi format video converter which helps you convert videos between media formats such as AVI, MP4, WMV, MOV, MPEG, FLV and other video file formats. It also supports HD video conversion. With this professional program, you can get converted videos with lossless quality and then play them on digital multimedia devices. 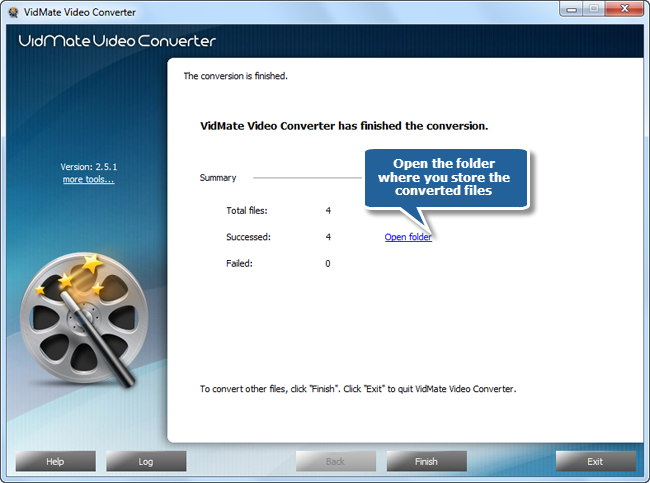 This tutorial will show you How to Convert Video with VidMate Video Converter, the best video converter software. TO convert video, launch VidMate Video Converter first. Click “Add Video” button to add video files to the conversion list, or you can drag & drop to add video files. You can also remove one or all listed files by clicking “Delete” or “Clear”button. Change the sequence of the listed videos by “Move Up” & “Move Down” button or just by dragging them to the defined position. Click “Select…” to choose an output directory to save converted videos. Click “Video” tag to specify an output format. Choose output setting from the dropdown menu of “Presets” for more precise output quality adjustment. “Devices” and “Audio” are also supported. Then, click “Convert” to start conversion. Within few seconds, you can see some conversion information and progress bar. You can choose onepost-process option (Auto play a sound or shutdown the computer after conversion). When the conversion is finished, a brief task report will be displayed. Click the “Open folder” to directly open the output folder in case you don’t know where your output file is saved. Now, enjoy the converted videos in your video player!